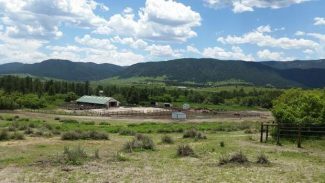 Marty Metzger | Ft. Collins, Colo.
Stone Pine Farm is home to more than 40 Morgan horses in training. SP Remington, aka âMax,â riden by trainer Rick Gervasio, compete at Morgan Grand Nationals. 2013 Reserve World Champion Western Pleasure Horse. Stone Pine Farm is a 51-acre Morgan horse training facility with all the amenities its animals and their people could dream of. Its 14-stall barn can be easily converted from 12-foot by 12-foot boxes to 12- by 24-foot foaling stalls. A large outdoor arena and round pen are adjacent to riding paths, with additional access available to nearby Douglas County open space trails. 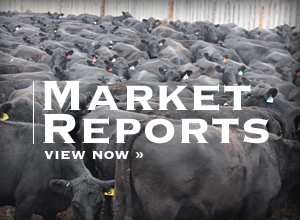 The Larkspur, Colo., property is owned by Marilyn and Bill Esteb, who have two grown sons. Jon and wife Kim live in Virginia with their children, Elana and Finn. The Estebs' younger son, Eric, resides in Parker, Colo. But it's Marilyn whose heart beats loudest for Stone Pine Farm. The 65-year-old equestrian is a Colorado Springs native who grew up in the Seattle, Wash., area. At age 13, she bought her first horse, Misty, for $100. The barely broke 3-year-old filly and the green teen shared many delightful riding adventures in the Green River Valley. But they sadly parted company when the family moved back to Colorado Springs. All things equine sat on the back burner until Esteb was in her early 40s, when the embers were fanned back into a roaring fire. "I decided that I wanted another horse, possibly a driving horse," she recalled. "I went to several Arabian shows thinking I wanted an Arabian. The breed, although extremely beautiful, didn't grab my heart." That disappointment didn't deter fate, however. Esteb was a horseless horsewoman eagerly seeking her equine niche. "On the way home one day, I noticed that there was a Morgan show going on at the Penrose Events Center in Colorado Springs. I remember walking up to the arena where I saw the most beautiful Morgan driving horses. They were high-stepping with beautiful, full bodies, beautiful heads and long, flowing manes and tails. I fell in love with the Morgan breed," said Esteb. Under the guidance of local California trainers Bob Kellert and Mary Cockriel, she bought her first Morgan at a Santa Barbara show. 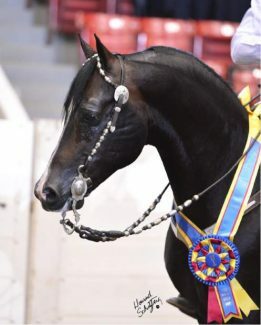 That black weanling filly, named MLF Careless Love, went on to become a great competition horse for Esteb, including winning the World Champion 3-Year-Old Hunter Pleasure class in Oklahoma City. 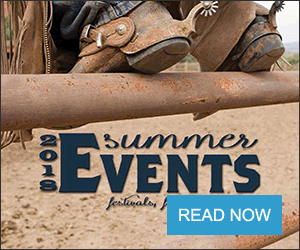 For about 20 years now, Stone Pine has been turning out more quality horses that compete in regional breed shows and at the Morgan Grand Nationals held each year in mid-October in Oklahoma City. The farm has had numerous regional, grand national and world champions over the years. Currently, their Western Pleasure stallion, SP Remington (aka "Max") is in training with Rick Gervasio in Ocala, Fla. 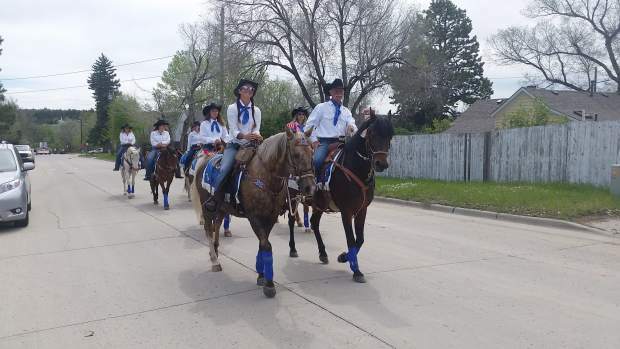 The beautiful, talented horse was Champion Open Western Pleasure Horse at the Citrus Cup and Gold Cup earlier this year and will compete in October at Oklahoma City. In 2016, the 11-year-old stallion will stand at stud to some outside mares. Stone Pine Farm activities tapered off due to the economy drop in 2008. Previously, Esteb had thoroughly enjoyed buying and breeding, with 60 Morgans in residence. The current head count of 41 is as high as it's been since then. Several young horses in various stages of training were joined this year by Stone Pine Charlotte, the farm's first foal born there since 2008. "It's so much fun to have a baby around again after so many years," Esteb happily reported. However, she added that they'll do very little breeding in the future. Her husband is hopeful that they can outlive the horses and someday retire. A younger member of the Stone Pine team who is far, far away from retirement is 27-year-old Keri Wilson, farm manager. 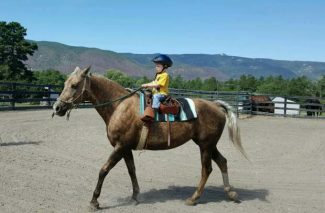 Born in Prescott, Ariz., Wilson grew up riding Josh, an elderly grey Arabian that belonged to a friend of her mother. She then had a rescued thoroughbred named Liner. But the former racehorse was too much for the teenage girl to handle. So, in 2004, he was re-homed to a rescue group that specialized in retraining OTTBs. Dakota, an old Paint Wilson simultaneously owned, had to be euthanized in 2006 after contracting West Nile virus. 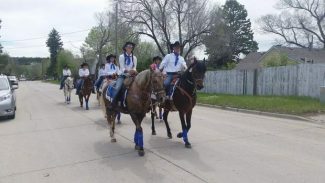 Wilson graduated high school that same year and strayed from the equine world until relocating to Colorado in 2011. She stepped back onto the scene by first volunteering at an Aurora trail/boarding facility while attending Bel Rea to become a veterinary technician. In November 2013, she filled in part-time at SPF as groundskeeper. After two months, she was asked to stay on full-time and her duties advanced from basic animal care to riding/selling horses. She was introduced to James Morgan in early 2014. The local trainer with the same surname as Stone Pine's breed of choice started Wilson on the James Morgan Horsemanship Program of gentle, happy, respectful horses. One of her goals is to re-train rescue horses. A friend of hers, Tiffany Ritz, has adopted three from Shiloh Acres Horse Rescue (SAHR) in Ault, Colo. Wilson plans to soon start training for SAHR, thereby enhancing their horses' adoption potential while also furthering her own training resume and career. Unmarried and with no children, she is free to work as hard as she chooses and devote as much time as she wants to the equestrian lifestyle. She recently adopted a 3-year-old paint mare from SAHR. "I plan on having her be my living business card of my personal training accomplishments," stated Wilson. 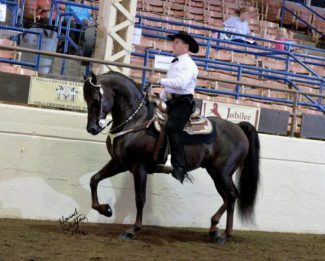 Esteb defines Morgans as a versatile breed both in harness and under saddle. They successfully compete in pleasure classes, endurance events, over hunter/jumper courses, in-hand, trail, western dressage, eventing, English and Western pleasure, and more. Their people-loving personalities make them awesome family horses. The breed's sole foundation sire is Figure, later renamed Justin Morgan for his schoolteacher-owner who acquired Figure as a 2-year-old. Foaled around 1793 in Springfield, Mass., the 14 hands high bay colt was unbeaten in his career in saddle and harness races and in weight-pulling contests. A popular sire, he stamped his progeny with his distinctive characteristics — conformation, incredible stamina, strength, boldness, intelligence, longevity — and thereby founded a new breed. Today's Morgans stand 14.2 hh-15.2 hh. Solid, strong legs with short canon bones serve them well and soundly in whatever equestrian discipline they undertake. Any solid color is acceptable for registration. Esteb quoted from the Morgan Breed Statement: "The beauty of the Morgan horse lifts the heart. The breed exists solely because they please people. It's their heritage."